Objective: To explore the potential insecticidal, ovipositor deterrent and antifeedant effects of ethyl acetate extract of the seeds of Senna tora (Syn. Cassia tora) against cowpea weevil (Callosobruchus maculatus). Methods: The activities were evaluated using standard protocols. In these bioassays, the cowpea seeds were used directly as an insect feed. The activity of the extract and isolated compounds were tested at concentrations of 100, 200 and 300 μg/mL and compared to neem oil and cinnamaldehyde (as standard positive controls). Phytochemical analysis of the ethyl acetate extract was done through a number of chromatographic techniques and the structures of the isolated compounds were established through comprehensive spectroscopic analysis including 2D-NMR and ESI-MS studies. Results: Fractionation of the active ethyl acetate extract resulted in the isolation of one known anthraquinone, aurantio-obtusin (1) and a novel compound that was named as cassiatorin (2). Compounds 1 and 2 showed comparable insect antifeedant properties with the positive controls while their insecticidal and ovipositor deterrent effects were far superior to the standard controls. Conclusions: It is thus concluded that Senna tora extracts and the isolated compounds (1 and 2) may be employed in the postharvest management of stored cowpea seeds and as other crop protectants. Southwest Cameroon falls within an evergreen tropical rainforest that is widely exploited for farming valuable cash crops. It has a rich biodiversity characterized by tall trees and fertile volcanic soils. In this region, insect pests such as Zonocerus variegatus (Z. variegatus) L. (Green locust, commonly known as smelling grasshopper or rainbow grasshopper) destroy over 50% of crops cultivated during the rainy season. The pests feed on all fresh green leafy plant tissues, including crops like egusi (60%-70%) being its delicacy, young maize (50%-60%), sweet potatoes (55%-65%), oranges (20%-40%), cassava (50%-60%), banana (45%-55%), plantain (40%-55%), oil palms (40%-55%), groundnuts (55%-65%), garden eggs (55%-65%), coffee (45%-55%), cocoa (45%-55%) and okro (50%-60%),. Farmers and agriculture extension workers in the region have well recognized that insect pests are a threat to most crops causing food shortages and famine especially in years of extended dry seasons. So far, little or no success has been achieved by the application of different methods including manual trapping and chemicals through the use of insecticides. In fact, there has been generally minimal usage of chemical methods of pest control in this region, while biological and ecological methods are not available at all. Similar challenges are faced by farmers during cultivation and storage of cowpea (Vigna unguiculata) seeds. Stored cowpea seeds are particularly destroyed by the weevil, Callosobruchus maculatus. Neem oil and cinnamaldehyde are the two common pesticides frequently used by the farmers as grain protectants. The resolve of farmers to revert to the use of natural pesticides in recent years, after years of complete reliance on synthetic pesticides, has been largely due to concerns of toxicity and persistence in the environment of the latter. There is a large public outcry against synthetic pesticides as they pose severe human health and environmental problems. The large-scale use of synthetic insect deterrents, have been shown to generally cause numerous hazards on the environment and cause intoxication of non-targeted organisms including humans. Thus, the tide seem to favour the age old use of aromatic oils and other plant products such as rotenone, limonoids and other botanicals as comparatively safer alternatives,. It is therefore imperative that studies on natural pest control agents are encouraged. However, there are reports of reduction in germination of grains when they are treated with neem oil. Furthermore, when applied to the grains, the bitter oil of neem is difficult to remove and has been associated with health problems including leukocytosis and metabolic acidosis. Hence, there has been a flurry of world-wide effort by scientists in recent years to search for insecticides that can be safely applied not only on the farm but also during postharvest grain storage processes. The practice of indigenous system of Senna tora (S. tora), known by its synonym Cassia tora L. (Leguminosae), in agro-forestry on the farmlands of the South-West region of Cameroon is playing an essential role. It offers a natural environment which prevents Z. variegatus L. and other insect pests from causing severe damage to both mixed and mono-cropping farms. S. tora is not only cheap to grow and environmentally safe with increased benefits in maintaining the ecology and biodiversity but also eliminates invasive weeds (e.g. Centrosema pubescens) along with insect pests (e.g., Z. variegatus L). A preliminary investigation carried out in the SouthWest region of Cameroon in 2009 on maize and other plants intercropped with S. tora revealed insecticidal and feeding inhibitory properties against Z. variegatus. Mixed cropping with S. tora trees is also known to prevent the spread of pest epidemics in plant communities and enhance crop production. Mbatchou et al, reported the mosquito larvicidal activity of S. tora seed extract and its key anthraquinones aurantio-obtusin and obtusin. Even though, the cyclitol compound, ononitol monohydrate, with some general larvicidal activity has been isolated from the leaves of S. tora, the toxicity and feeding inhibition activities of the seeds against cowpea weevils and the active principles responsible for such actions have not yet been validated. This study was therefore designed to evaluate the potential insecticidal, feeding inhibition and ovipositor deterrent activities of the S. tora seeds against cowpea weevil through functional assays that directly employed cowpea seeds’ infestation. In our successful attempt to isolate the active principles, the identification of a novel compound trivially named ‘cassiatorin’(2) along with a known compound, aurantio-obtusin (1), with comparable to superior activity than the standard positive controls (neem oil and cinnamaldehyde) is also discussed. The vehicle used in this study, acetone was of analytical grade and was sourced from Sigma-Aldrich Chemicals Ltd (St Louis, Missouri, USA). Clarified hydrophobic extract of neem oil as a broad spectrum fungicide, insecticide and miticide of botanical origin was obtained from Southern Agricultural Insecticide Inc. (Palmetto, Florida, USA) while cinnamaldehyde was from BDH Chemicals Ltd (Poole, England). All other reagents and solvents were of either analytical or regent grades and were sourced from Sigma-Aldrich. Pods containing S. tora seeds were randomly harvested from trees in the vicinity of Kramah quarters, Kumba, South-West region, Cameroon in March 2013. They were identified by botanists at the Department of Applied Biology (University for Development Studies, Ghana) where a voucher specimen (AB/4/160/13) has been deposited. The seed-pods of S. tora were opened and air dried at room temperature (25 °C) for one week, and ground into powder with the aid of mortar and pestle. The powdered seeds (5 kg) were defatted by soxhlet extraction using petroleum ether and then extracted by ethyl acetate until exhaustion to yield 25.5 g of the crude extract. Cowpea seeds, not previously subjected to any pesticide but infested by cowpea weevils, were bought from Gitarhai grain market, Nairobi, Kenya. Seeds without perforations, but with eggs glued on their surfaces were selected from infested grains, kept in plastic containers and covered with muslin clothe as lids aided by rubber bands. They were then taken to the insectaria of the International Centre for Insect Physiology and Ecology (Kenya), and kept at humidity and temperature of (78±2)% and (28±3) °C respectively. In the room maintained at 12 h day and 12 h night cycle, the incubation was extended for 30-34 d until emergence of young adults’ cowpea weevils. Cowpea seeds harvested from fields not subjected to any pesticide treatments were obtained from farmers who work under the supervision of International Centre for Insect Physiology and Ecology, Kenya. Cowpea seeds were checked for not having holes, windows and eggs on their surfaces, and then kept in an air tight glass jar in a freezer at -20 °C for 5 d to kill all hidden infestations. The disinfested cowpea seeds inside the air tight glass jar were then removed from the freezer, kept at room temperature (25 °C) for 3 h followed by incubation at 40 °C for 2 h. The seeds were then spread on clean sheets of paper at room temperature to air dry and prevent mouldiness before they were stored in plastic containers with tight lids. The experimental groups were composed of: (i) test drugs including the crude extract and isolated compounds, (ii) positive controls (neem oil and cinnamaldehyde), (iii) vehicle control group treated with acetone, and (iv) no-vehicle, no drug-treated group (untreated groups). All drug treatments (crude extract, isolated compounds and positive controls) were tested at three different concentrations (100, 200 and 300 μg/mL). For the application of drugs/vehicle, disinfected cowpea seeds (2.50 g) in sample vials were separately immersed in 1 mL each of the drug preparations in acetone, stirred and left in open air to dry overnight. All experiments were set up in triplicate. Before the bioassay experiments, insects were sexed according to standard methods. Lethal time-50 (LT50), the time taken for 50% of the adult population to die, was also calculated from the log concentration plot of test compounds. Comparison of the calculated oviposition deterrence index for the isolated compounds with the standard reference and the crude ethyl acetate extract was done statistically using One Way Anova followed by Newman-Keul’s multiple comparison test. The ethyl acetate extract (EtOAc) (22.5 g) was loaded onto a silica gel (70-150 Mesh ASTM) glass column of diameter 35 mm (400 mm long) and eluted with solvents of increasing polarity: pet ether (100%, 1 000 mL), pet ether-EtOAc (95:5, 1 500 mL; 90:10, 1 000 mL; 85:15, 1 500 mL; 75:25, 1 000 mL; 65:35, 1 000 mL; 50:50, 1 000 mL; 30:70, 2 500 mL; 20:80, 1 000 mL) and finally EtOAc (1 000 mL). The eluates were concentrated under reduced pressure on a rotary evaporator at 40 °C and bulked into five fractions based on their TLC profiles. The plates were visualized under UV-lamp at 254 and 365 nm and sprayed with anisaldehyde/H2SO4 and ethanolic potassium hydroxide as detecting reagents. The bulked fraction-3 (4.0 g) obtained from elution with gradient mixtures of pet-ether/EtOAc (85:15 to 75:25) was further subjected to repeated column chromatography on silica gel using gradient mixtures of pet-ether and ethyl acetate. This afforded a red crystalline fraction which was washed repeatedly with pet ether to give compound 2 (0.72 g). Bulked fraction-4 (3.5 g) which was eluted with gradient mixtures of pet-ether/EtOAc (7:3 to 1:1) was chromatographed (silica gel) isocratically with pet-ether/EtOAc (1:1) to give a semi-solid mass which was subsequently washed repeatedly with CHCl3:MeOH (1:1) to afford compound 1 as a yellow powder (1.95 g). The first two nonpolar and last bulked fractions did not yield compounds and hence not followed up. 1H NMR, 13C NMR and 2D-NMR (HMQC and HMBC) spectra were obtained on a JEOL 500 MHz instrument. Homonuclear 1H connectivities were determined by using the COSY experiment. One bond 1H-13C connectivities were determined with HMQC while two- and three-bond 1H–13C connectivities were determined by HMBC experiments. Chemical shifts were reported in (ppm) using the solvent (Dimethyl sulfoxide-D6) standard. Melting point was measured using Stuart Digital Melting Point SMP10 instrument (Bibby Scientific Limited, Staffordshire, UK). IR and UV spectra were obtained using Perkin Elmer Spectrum two FTIR (Coventry, UK) and Hitachi U-2900 spectrophotometers respectively. High resolution mass spectroscopy instrument and Thermofisher LTQ Orbitrap XL (Thermofisher Scientific, UK), with an electrospray ionisation probe were used for accurate mass measurement over the full mass range of m/z 50–2 000. Nano-electrospray analyses were performed in positive ionization mode by using NanoMate to deliver samples diluted into MeOH + 10% NH4OAc. The temperature was set at 200 °C , sheath gas flow of 2 units and capillary (ionizing) voltage at 1.4 kV. The accurate mass measurements obtained from this system were far better than 3 ppm. All experiments were carried out in triplicates and the results were given as mean±standard error of mean (SEM). Where necessary, unpaired student t-test was employed to assess significant differences (P<0.05) between two mean values. After defatting the plant material, extraction with ethyl acetate gave a crude extract with the yield of 0.51%. Fractionation of the crude extract with column chromatography over silica gel followed by repeated separation steps led to the isolation of two compounds that appeared yellow in colour. All the spectroscopic data including UV, IR, MS and 2D-NMR [Table 1] for compound 1 were similar with those reported for aurantio-obtusin which was previously isolated from S. tora. On the basis of the comprehensive spectroscopic analysis including NMR (Table 1) and comparative analysis with compound 1 (aurantio-obtusin), compound 2 was identified as a new compound named, cassiatorin (2) [Figure 1]. Figure 1: Compound aurantio-obtusin (1) and cassiatorin (2). 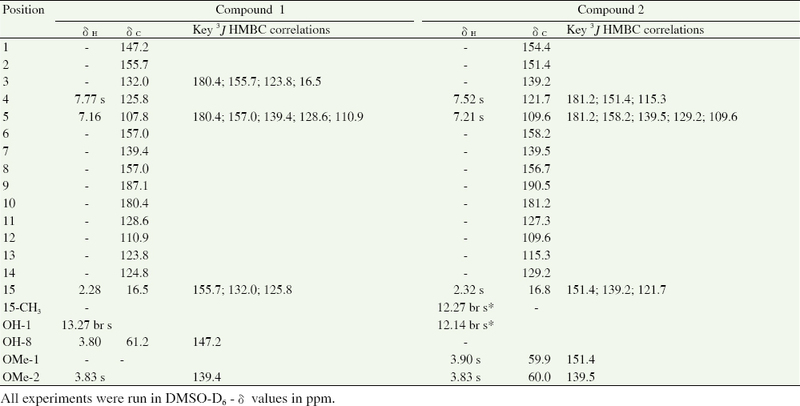 Table 1: 1H, 13C and 3J HMBC NMR data for compounds 1 and 2. Yellow powder; mp 246-250 °C; UV (MeOH) λ max nm ( ε ): 217 (1 758), 285 (1 637), 314 (638), 401 (355); IR (Universal Attenuated Total Reflectance) υ max; 3 305 (br), 2 918, 2 850, 1 732, 1 658, 1 624, 1 580, 1 447, 1 392, 1 309, 1 262, 1 176, 1 089, 999, 715 cm-1; 1H and 13C NMR (DMSO-D6): [Table 1]. ESI-MS m/z [M+H]+ 331.081 5 (calc C17H14O7 plus H, 331.081 2). Yellow powder; mp 162-268 °C; UV (MeOH) λ max nm ( ε ): 217 (1 758), 285 (1 637), 314 (638), 401 (355); IR (Universal Attenuated Total Reflectance) υ max; 3 305 (br), 3 305 (br), 2 918, 2 850, 1 932, 1 656, 1 624, 1 580, 1 447, 1 392, 1 309, 1 262, 1 176, 1 089, 1 024, 971, 715 cm-1; 1H and 13C NMR (DMSO-D6): [Table 1]. ESI-MS m/z [M+H]+ 331.081 5 (calc C17H14O7 plus H, 331.081 2). The time- and concentration-dependent mortality effect of the crude extract, positive controls and isolated compounds are shown in [Figure 2]a, [Figure 2]b, [Figure 2]c, [Figure 2]d, [Figure 2]e. An onset of mortality effect faster than the standards were observed both for the isolated compounds [Figure 2]d, [Figure 2]e and the crude extract [Figure 2]a even though the concentration-dependent effect over the tested concentration range were not clearly evident in this bioassay system. The overall insecticidal profile of the extract and isolated compounds in comparison with the standards was evaluated using the lethal time-50 (LT50). The rank order of insecticidal activity based on the LT50 [Table 2] is the ethyl acetate extract>compound 2>compound 1>cinnamaldehyde>neem oil. Figure 2: Insecticidal effect of the crude ethyl acetate extract, standard positive controls and the isolated compounds (1 and 2) of S. tora seeds. a: crude ethyl acetate extract, b: neem oil, c: cinnamaldehyde. Table 2: Insecticidal effect of ethyl acetate extract and compounds (1 and 2) on weevils (mean±SEM). The potential oviposition deterrence effect of the crude extract and those of the isolated compounds are shown in [Figure 3]. The extract and compounds showed concentration dependent oviposition deterrence effect. 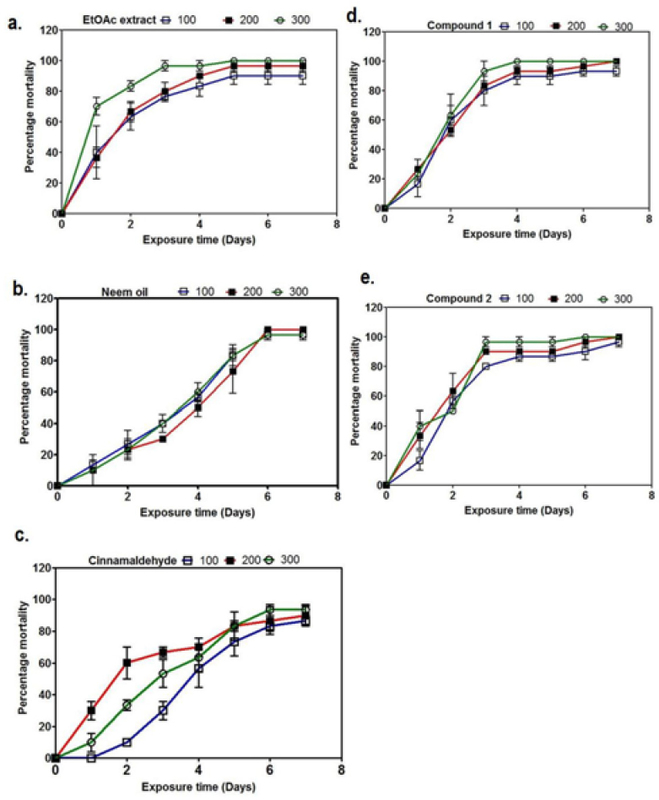 Compounds 1 and 2, even at low concentration (100 μg/mL), showed significant (P<0.05) oviposition deterrence effect compared to the reference drugs [Figure 3]. The ethyl acetate extract showed no activity at this concentration. The oviposition deterrence effect of cinnamaldehyde was only comparable to the isolated compounds at higher concentrations. All these data demonstrate the potential oviposition deterrence and/or crop protection effect of the isolated compounds. Figure 3: Oviposition deterrence effect of crude ethyl acetate extract of S. tora seeds, reference and isolated compounds. Data are mean±SEM (n=3). *P<0.05, indicates significant difference between ethyl acetate extract versus compound 1 or 2 . One Way Anova followed by Newman-Keuls multiple comparison test. Similarly, in the antifeedant activity, the compounds showed comparable activity to cinnamaldehyde [Figure 4]. The ethyl acetate extract again showed a very weak activity even at higher concentrations. 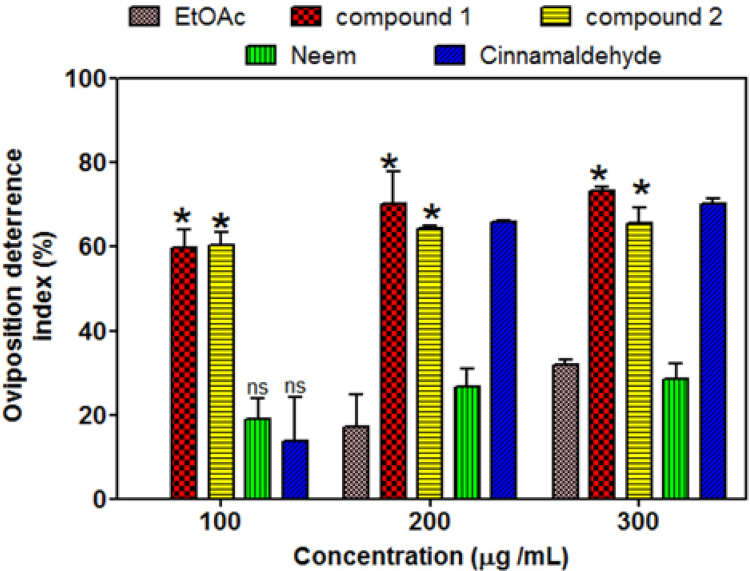 The antifeedant index [Figure 4] clearly displayed the potential crop protection activity of the isolated compounds and cinnamaldehyde and thus represent a possible alternative to neem oil as crop protectants. The activities of the two compounds were very high at all concentrations. Figure 4: Antifeedant index calculated for isolated compounds and positive controls. Data are mean±SEM from three determinations. ***P<0.001, **P<0.01, *P<0.05 indicates significant difference between compounds/standards and EtOAc. One Way Anova followed Neman-Keuls post hoc test. Fractionation of the crude extract of S. tora seeds with column chromatography over silica gel followed by repeated separation steps led to the isolation of two compounds that appeared yellow in colour. The identification of compound 1 as aurantio-obtusin which has been reported before from the same plant by several authors, was straight forward. The spectroscopic data including 1D and 2D NMR resonances was also in perfect agreement with this assignment. Accurate mass analysis using high resolution ESI- MS instrument showed the [M + H]+, C17H14O7, ion of the second compound (2) at m/z 331.081 2 (expected/theoretical 331.081 5). The MS data along with the UV and IR spectra of compound 2 showed astonishing similarity (in fact overlapping) with that of compound 1, but close inspection of the NMR data revealed apparent differences in the chemical shifts of some δ H/ δ C signals. The 13C and Dept-135 NMR spectra showed signals indicating the presence of 17-carbons of which, two were carbonyls; two olefinic methine, two methoxyl methyls, one deshielded methyl and the rest being quaternary olefinic groups. Unambiguous assignment of the NMR signals and the structure as 2 came from comprehensive 2D- NMR studies (HMQC and HMBC). The 3J HMBC connectivities between the methoxyl protons and the anthraquinone skeleton allowed the identification of the methoxyl bearing carbons. While the assignment of one of the methoxyl group at the C-7 carbon was similar with that of compound 1, the second methoxyl in compound 2 was unambiguously assigned at position 3 as a 3J HMBC connectivity was observed between H-4 and C-2. Moreover, the presence of two chelated hydroxyl signals in the 1H NMR spectra (unlike compound 1 which showed only one) suggests the presence of free hydroxyl groups at position C-1 and C-8. As expected in compound 2 where the free hydroxyl instead of methoxyl group is located at C-1 position, the chemical shift of C-13 is shifted upfield as compared with compound 1. Hence, a novel structure 2 is herewith identified from S. tora that we named ‘cassiatorin’. Given that anthraquinones from Cassia species are widely known with their trivial name of botanical origin, we consider the naming of the compound as ‘cassiatorin’ as most appropriate. According to the IUPAC nomenclature, aurantio-obtusin (1) is named as 1, 3, 7- trihydroxy-2,8-dimethoxy-6-methyl-9,10-anthraquinone. Hence, cassiatorin (2) by IUPAC nomenclature can also be named as 1, 3, 8-trihydroxy-2,7-dimethoxy-6-methyl-9,10-anthraquinone. Readers should note that the numbering of carbons in the structures and results following the common anthraquinones numbering and should not be confused with the IUPAC system. There has been no reported case of S. tora seed toxicity to man since the beginning of its consumption as tea, and as food primarily in India during times of food scarcity. Some preliminary data have already shown that S. tora possess insecticidal and feeding inhibitory properties against Z. variegatus while mixed cropping with S. tora has been claimed to enhance crop production. With high protein (about 25% by weight) and several vitamins and mineral constituents, cowpea is one of the most important crops with estimated 5.4 million tons produced worldwide annually, of which, production in Africa constitute nearly 5.2 million tons. Postharvest destruction by insect pests, primarily cowpea weevil, is however a major challenge that farmers (particularly in Africa) have not yet overcome. The potential insecticidal/deterrent effects of S. tora seed extract and its constituents, including the one herein reported as a novel anthraquinone, is scrutinized in this communication. For this, a functional assay employing the same insect pest and the crop was adopted from which three common parameters; mortality, oviposition deterrence and feeding were assessed. The selection of the positive controls, neem oil and cinnamaldehyde, in our study was based on numerous previous reports where these standards were employed for effective insect pests’ management including suppressing the survival, egg deposition and feeding of cowpea weevil on stored cowpea seeds,,,. In the first instance, the insecticidal effects of the ethyl acetate extract along with the two isolated compounds (1 and 2) and standard positive controls (neem oil and cinnamaldehyde) were evaluated against adult cowpea weevil survival. Through the oneweek assay that employed three dose-regime and protocol of lethality recording on daily basis, the time-dependent effect of all the tested compounds were validated. It appears that the crude extract has a quick onset of dose- and time-dependant lethality to cowpea weevils with over 50% mortality recorded within 2 d. For the isolated compounds (1 and 2) and positive controls, the time-dependent mortality effect was evident but the selected doses appear to have close concentration-activity profile and hence clear dose-dependent effect was not demonstrated. Hence, comparative analysis of relative potency was made by calculating the overall LT50 for each tested drug sample. Compounds 1 and 2 have identical activity profile (no significant difference at P<0.05) that was remarkably superior to either the neem oil or cinnamaldehyde positive control. In all of the bioassays that we have carried out, the acetone (used to impregnate the seeds with the test substances) vehicle did not have any effect when compared with untreated seeds (data not shown). The data therefore clearly show that compounds 1 and 2 have good potential insecticidal properties that may even exceed those of the standard controls. The higher insecticidal effect of the crude ethyl acetate extract than compounds 1 and 2 suggest a possible synergistic effect. In addition to the assessment of lethality to adult cowpea weevils, a variety of chemicals have been shown to modulate insects oviposition responses leading to reduced level of egg deposition on the surface of crops/seeds,. Hence, drugs possessing both insecticidal and oviposition deterrent effects are the ultimate choice as crop protectants. The comparative oviposition inhibitory activity of the extract, controls and isolated compounds was evaluated using the oviposition deterrence index. The percent oviposition deterrence index data of the isolated S. tora compounds once again revealed a remarkable superiority over the two reference compounds, with cinnamaldehyde being very active at higher concentrations. The crude ethyl acetate extract of S. tora seeds showed a time- and concentration-dependent oviposition deterrence effect. It however showed no activity at 100 μg/mL. Similarly, neem oil appeared to have a weaker effect for the lowest concentration tested (100 μg/mL). The oviposition inhibitory activity profile of the isolated compounds was significantly higher than the crude extract (P<0.05). Thus purification afforded a better oviposition deterrence activity. 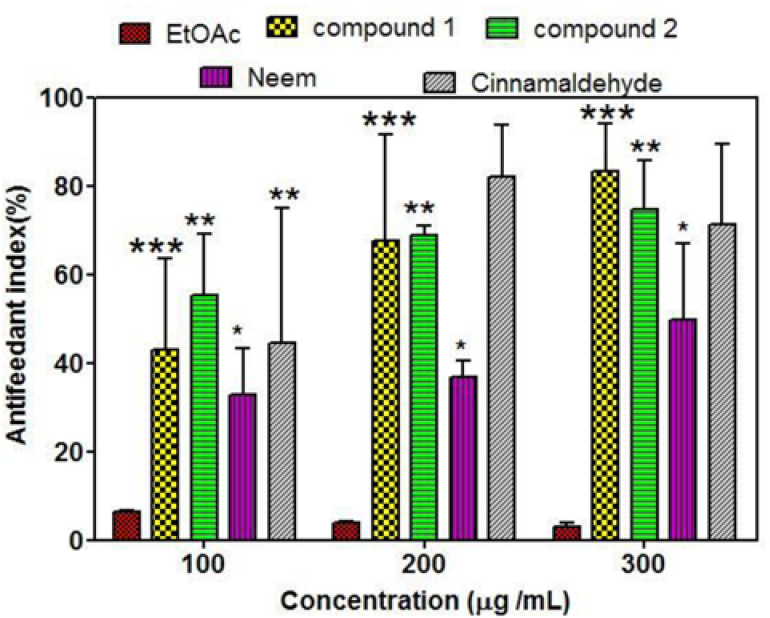 For all the concentrations tested, compounds 1 and 2 possess by order of magnitude more oviposition deterrent effect than neem oil, while about 3-fold superiority over cinnamaldehyde was observed for the lowest concentration tested. Another common parameter employed in crop protection studies is feeding inhibition assay. Of hundreds of eggs laid by female adult weevil on the surface of cowpea seed, larvae emerge within 8 days and burrow into the bean. This means that the larvae feeds on the interior of the cowpea seeds until they emerge and exit as adults in 3-7 wk. Hence, we designed our experimental protocol for the assessment of infected cowpea seeds’ weight to be taken on day 27. In the first assessment, the ethyl acetate crude extract of S. tora seeds showed very weak feeding inhibition as the calculated percent antifeedant index was less than 10% at all the tested concentrations. Purification however afforded more potent antifeedant compounds (1 and 2). In this assay, it appears that the isolated compounds have comparable activity with the standard controls. It is also worth noting that S. tora seeds and its active metabolite, aurantio-obtusin (1), have been shown to display a variety of pharmacological effects that attributes to the acclaimed medicinal uses of the plant in traditional medicine. These include angiotensin converting enzyme inhibition, antialergic, antidiabetic, antitumour, hepatoprotective, hypolipidemic, hypotensive and osteoanabolic properties. The discovery of yet another bioactive compound, cassiatorin (2), in the present study, opened up more avenues to prove the therapeutic and insect pests’ management potential of S. tora seeds. Using cowpea seeds as a diet for cowpea weevil, the present study has established insecticidal, ovipositor deterrent and/or antifeedant properties for the ethyl acetate extract of S. tora seeds. Moreover, one known anthraquinone, aurantio-obtusin (1) and a novel compound that we named ‘cassiatorin’ (2), were isolated and their structures established through comprehensive spectroscopic analysis. Interestingly, these two compounds showed comparable insect antifeedant properties with the positive controls, neem oil and cinnamaldehyde, while their insecticidal and ovipositor deterrent effects were far superior to the standard controls. It is thus concluded that S. tora extracts and/or the isolated compounds (1 and 2) may be employed in the postharvest management of stored food or even other crops protection. On the basis of our study, further experiments on the screening of similar anthraquinones and lead optimisation through chemical studies is well merited. The technical assistance of staff at the Greenwich NMR Laboratory and our access to the state-of-the-art EPSRC National Mass Spectrometry Facilities at Swansea University (Singleton Park, Swansea, UK) were greatly appreciated. We thank Professor Baldwin Torto for useful discussions and advice. The financial assistance from the Swedish International Development Agency for some of the study (travel grant for Valantine Mbatchou) and Prof Baldywn Torto of Behavioural and Chemical Ecology Department, the International Center for Insect physiology and Ecology Kenya for allowing us to use their facility for the insect bioassay study were greatly appreciated. Sevilor K, Stephan W, Jean M, Manuel T. Farmers’ perception on the importance of variegated grasshopper (Zonocerus variegatus L.) in the agricultural production systems of the humid forest zone of Southern Cameroon. J Ethnobiol Ethnomed 2006; 2: 17. Suka E. Using agro-forestry to mitigate crop damaged by grasshoppers, invasive weeds and other pant plants. World Acad Sci Eng Technol 2011; 59: 1214-1220. Sevilor K, Jean M, Stephan W, Tindo M. Insect pests’ incidence and variations due to forest landscape degradation in the humid forest zone of Southern Cameroon. Farmer’s perception and the need for adopting an integrated pest management strategy. Afr J Biotechnol 2006; 5(7): 555-562. Pavela R. History, presence and perspective of using plant extracts as commercial botanical insecticides and farm products for protection against insects-A review. Plant Protect Sci 2016; 4(52): 229-241. Benelli G, Murugan K, Panneerselvam C, Madhiyazhagan P, Conti B, Nicoletti M. Old ingredients for a new recipe? Neem cake, a low-cost botanical by-product in the fight against mosquito-borne diseases. J Parasitol Res 2015; 114: 391-397. Ilesanmi JO and Gungula DT. Quality attributes of cowpea seeds stored with neem and moringa seed oils. WJAS 2013; 9(2): 155-160. Mbatchou VC, Tchouassi DP, Dickson RA, Annan K, Mensah AY, Amponsah IK et al. Mosquito larvicidal activity of Cassia tora seed extract and its key anthraquinones aurantio-obtusin and obtusin. Parasit Vectors 2017; 10: 562. Baskar K, Ignacimuthu S. Antifeedant, larvicidal and growth inhibitory effects of ononitol monohydrate isolated from Cassia tora L. against Helicoverpa armigera (Hub.) and Spodoptera litura (Fab.) (Lepidoptera: Noctuidae). Chemosphere 2012; 88(4): 384-388. Koehler PG. Biopesticides data sheet. Volume 2. Entomology and Nematology Dept, Cooperative extension service, Institute of Food and Agricultural Science, University of Florida, Gainesuilla; 2003, p. 326. Ndomo-Moualeu AF, Ulrichs C, Adler C. Behavioral responses of Callosobruchus maculatus to volatile organic compounds found in the headspace of dried green pea seeds. J Pest Sci 2016; 89: 107. Brari J, Thakur, DR. Insecticidal potential properties of citronellol derived ionic liquid against two major stored grain insect pests. J Entomol Zool Stud 2016; 4(3): 365-370. Hyun SK, Lee H, Kang SS, Chung HY, Choi JS. Inhibitory activities of Cassia tora and its anthraquinone constituents on angiotensin converting enzyme. Phytother Res 2009; 23(2): 178-184. Zhu L, Yu S, Zeng X, Fu X, Zhao M. Preparative separation and purification of five anthraquinones from Cassia tora L. by high-speed counter-current chromatography. Sep Purif Technol 2008; 63(3): 665-669. Das C, Dash S, Sahoo DC, Mohanty A, Rout D. Cassia tora: A phytopharmacological overview. Int J Res Ayurveda Pharm 2011; 2(4): 1162-1172.
International Institute of Tropical Agriculture. 2016. [Online] Available at: http://www.iita.org/cowpea. [Accessed on15 August 2017]. Brari J, Thakur DR. Insecticidal efficacy of essential oil from Cinnamomum zeylanicum Blume and its two major constituents against Callosobruchus maculatus (F.) and Sitophilus oryzae (L.). Int J Agric Technol 2015; 11(6): 1323-1336. Fatiha RA, Kada R, Khelil MA, Pujade-Villar J. Biological control against the cowpea weevil (Callosobruchus chinensis L., Coleoptera: Bruchidae) using essential oils of some medicinal plants. J Plant Prot Res 2014; 54(3): 211-217. Ilesanmi JO, Gungula DT. Quality attributes of cowpea seeds stored with neem and moringa seed oils. World J Agric Sci 2013; 9(2): 155-160. Upadhyay RK, Ahmad S. Management strategies for control of stored grain insect pests in farmer stores and public ware houses. World J Agric Sci 2011; 7(5): 527-549. Basukriadi A, Wilkins RM. Oviposition deterrent activities of Pachyrhizus erosus seed extract and other natural products on Plutella xylostella (Lepidoptera: Plutellidae). J Insect Sci 2014; 1(14):244. Kim M, Lim SJ, Lee HJ, Nho CW. Cassia tora seed extract and its active compound aurantio-obtusin inhibit allergic responses in IgE-mediated mast cells and anaphylactic models. J Agric Food Chem 2015; 63(41): 9037-9046. Jang DS, Lee GY, Kim YS, Lee YM, Kim CS, Yoo JL, Kim JS. Anthraquinones from the seeds of Cassia tora with inhibitory activity on protein glycation and aldose reductase. Biol Pharm Bull 2007; 30(11): 2207-2210. Park YB, Kim SB. Isolation and identification of antitumor promoters from the seeds of Cassia tora. J Microbiol Biotechnol 2011; 21(10): 1043-1048. Dhanasekaran M, Ignacimuthu S, Agastian P. Potential hepatoprotective activity of ononitol monohydrate isolated from Cassia tora L. on carbon tetrachloride induced hepatotoxicity in Wistar rats. Phytomedicine 2009; 16(9): 891-895. Tzeng TF, Lu HJ, Liou SS, Chang CJ, Liu IM. Reduction of lipid accumulation in white adipose tissues by Cassia tora (Leguminosae) seed extract is associated with AMPK activation. Food Chem 2013; 136(2): 1086-1094. Li S, Li Q, Lv X, Liao L, Yang W, Li S, Lu P, Zhu D. Aurantio-obtusin relaxes systemic arteries through endothelial PI3K/AKT/eNOS-dependent signaling pathway in rats. J Pharmacol Sci 2015; 128(3): 108-115. Vishnuprasad CN, Tsuchiya T, Kanegasaki S, Kim JH, Han SS. Aurantio-obtusin stimulates chemotactic migration and differentiation of MC3T3-E1 osteoblast cells. Planta Med 2014; 80(7): 544-549.